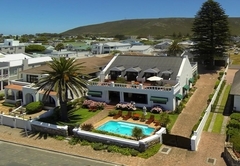 La Fontaine Hermanus is a 4 star graded guest house offering Hermanus accommodation in 5 guest rooms. 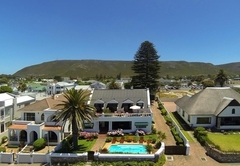 La Fontaine is a deluxe guest retreat perfect for a rejuvenating break, a golf vacation with a choice of courses, a perfect romantic getaway or whale viewing holiday in South Africa. 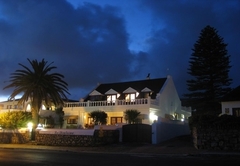 At the southernmost tip of Africa, perched on the edge of the majestic Atlantic Ocean, you will find a guest house that is very aptly named - La Fontaine embodies the symbolism of the fountain. It is the perfect place to relax, and rejuvenate body, mind and soul. 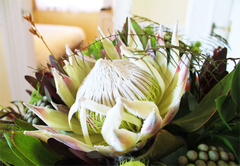 Decorated in elegant colonial style, the stylish bedrooms offer shared satellite TV, hairdryers, heated towel rails, mini bars and tea and coffee making facilities. Three of the bedrooms are upstairs with private balconies, two of which overlook the sea and the third is mountain facing. 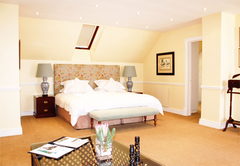 Large twin/double room with a lounge area, dressing room, full bathroom and large private balcony. 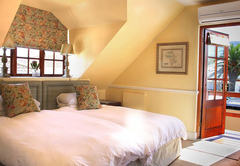 Two rooms, one room with double/twin beds and one room with two single beds, sharing an en-suite bathroom with shower. 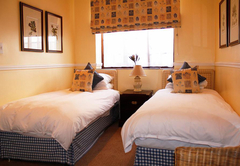 Sleeps four people and is suitable for a family with children, or elderly people. A cot can be provided upon request. 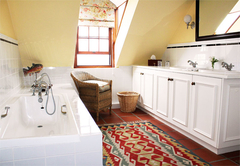 Upstairs room with en-suite bathroom with shower and private balcony. 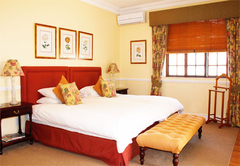 Spacious room with full en-suite bathroom and private outdoor area. 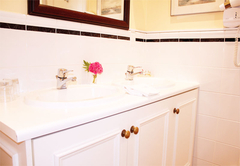 Queen size double room with en-suite bathroom and private sea facing balcony. 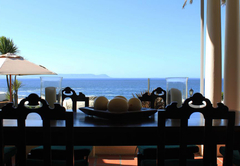 Weather permitting, breakfast is served on the patio with views across the bay, or in the privacy of your room. We have a cosy lounge with a fireplace in which to curl up and relax with a good book. 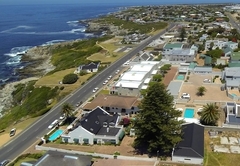 Take a dip in the sparkling pool, stroll the famous 15km long cliff path, or walk to the village shops, galleries and restaurants. We offer WiFi access, secure parking and reservation assistance for the many available activities or restaurants. 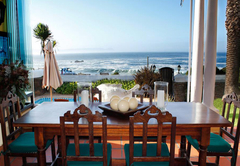 At La Fontaine you will find yourself immersed in comfortable luxury and surrounded by the uplifting sights and sounds of waves and Southern Right whales in season. 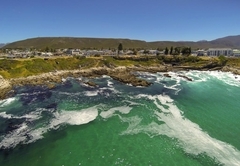 Hermanus is the best land based whale watching spot in the world – and La Fontaine has pride of place. Full suite complete with private sea-facing balcony, TV, full bathroom, dressing room, twin/kingsize bed and bar fridge. Double or twin/bedded room with mountain facing deck. En-suite shower, bar fridge, TV and DSTV channel. Large double room with full bathroom . TV & DSTV, private garden patio and Bar fridge. Twin beds available. 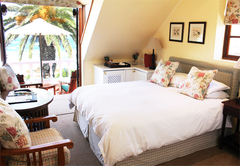 Double sea-facing room with private balcony, en-suite shower, TV/DSTV, bar fridge, hair drier etc. 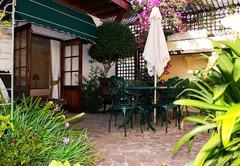 Excellent location within walking distance of most restaurants and the beach walking route. Beautiful establishment, fine attention to detail! 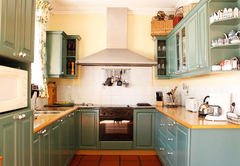 A wonderful guest house, very personal with family-like owners and staff. We stayed two nights and even thought about staying longer, but La Fontaine was already fully booked. The rooms as well as patio and living room are incredibly comfortable with an inviting Victorian furniture and very high attention to detail. The incredible highlight of our stay was when we watched whales right from the patio enjoying a delightful breakfast. We would always come back again and can truly recommend the place. Response timeLa Fontaine Hermanus typically responds to requests in 5-10 minutes.